What Do You Need to Know About Sleep Apnea in Mesquite? It’s impossible to put a price on a good night’s rest. After eight hours of solid shuteye, you’re energized to tackle whatever your day might throw at you. Your mind and body work better than if you had tossed and turned all night. But, what if despite your efforts to get enough sleep, you’re still tired all the time? You may have a disorder that interferes with your rest. What exactly is sleep apnea in Mesquite, and how can your local dentist help you to once again get all the time in dreamland that you deserve? Obstructive sleep apnea is a condition wherein something partially or fully blocks your upper airway while you’re asleep. The thing that is blocking your airway may be your tongue or the muscles in your throat; they can relax too much and make it very difficult for you to get air into your lungs. When this happens, you’ll resume breathing after a loud gasp, snort, or body jerk. You’re very tired or sleepy during the day. You wake up with a dry mouth or sore throat. It is difficult for you to concentrate, or you experience mood swings. You wake up suddenly, and you feel like you’re choking. You often wake up with a headache. You’re a little sleepy during the day — but is obstructive sleep apnea really something to worry about? Yes! 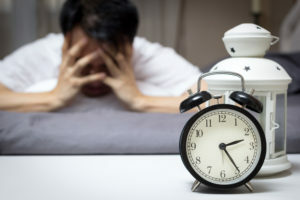 If you are continually sleep deprived, you are more likely to suffer from serious medical conditions, such as heart disease, type 2 diabetes, weight gain, high blood pressure, and acid reflux. Furthermore, operating a car or other heavy machinery while you’re drowsy greatly increases the risk that you’ll be involved in an accident. If you suspect you have sleep apnea, head to your physician so you can get an official diagnosis. If it’s confirmed that you have this condition, you have several treatment options in front of you. One of the most convenient options is a custom-made oral appliance from your dentist in Mesquite. The device will gently reposition your jaw so you can breathe easy during the night. If your sleep apnea is severe enough, an oral appliance may not be enough to address your condition. You may need a CPAP machine. However, your dentist can still help. They can design a custom mask for your machine; it will be more comfortable than a regular mask and will cut back on noise from the CPAP. Feeling a little drowsy? Learn to recognize the signs of sleep apnea so you can get back to resting well as soon as possible. Dr. Byron McKnight is your proud dentist in Mesquite. He and his team provide personalized care to patients, whether they come in for a routine cleaning or they need help with sleep apnea. If you have questions about how you can breathe easier at night, contact Dr. McKnight’s team at 972-698-8000. Comments Off on What Do You Need to Know About Sleep Apnea in Mesquite?